The Zionists are reaacting evrywhere to the bDS call, inventing bizarre organisations like TULIP below, in order to bamboozle the naive and simple-minded, who, afetr 42 years of occupation,stillthink we need to smile at each other more often,and that will resolve all... On a more positive note – this proves their desperation and urgency, and the fact they recognise, as below, that the BDSmovement is provbably unstoppable! Article from: The Australian LAST month, the Scottish Trade Unions Congress became the latest in a series of unions to call for a boycott of Israeli products. Support for boycotting, divesting from and sanctions against the Jewish state appears to be growing by leaps and bounds. It has already won considerable support from trade unions in South Africa, Ireland, Britain and Norway. It seems unstoppable. But we intend to stop it. TULIP – Trade Unions Linking Israel and Palestine – is a new global movement that believes in engaging with workers and their unions in Israel and Palestine, promoting co-operation and reconciliation. We do not believe in boycotts, divestment and sanctions. We believe in peace and in a two-state solution to the conflict. Our new global movement seeks allies in unions and non-governmental organisations everywhere who want to work together to demand respect for all Palestinians, Israelis and guest workers living in that region. We believe we can take significant strides towards peace and reconciliation if we support those striving to improve the living standards of all working people in the region. There are outstanding examples of co-operation between Israeli and Palestinian unions that need to be encouraged. For example, there’s a remarkable initiative launched by the International Transport Workers Federation to make life much easier for Palestinian drivers. This has been a small but ground-breaking union agreement encouraging dialogue between the Palestinian and Israeli national trade union centres, as well as individual unions and their members on both sides of the divide. This agreement will help improve the livelihoods of hard-working union truckers and their families. As we write this the ITF is organising to move this important project to a higher level with the co-operation of the Israel trade union congress Histadrut and the Palestinian transport workers union. This model is a firm rejection of those in trade unions promoting an Israel boycott movement. This model upholds the traditional role of trade unions when faced with disputes of this kind: bridging the gap between nations at war, encouraging peace, justice and conciliation. It is a trade union tradition and role that we are particularly proud to uphold. We also applaud the role of the International Trade Union Confederation, which has helped to broker co-operation agreements between the Histadrut and the Palestinian General Federation of Trade Unions. It is unfortunate that in recent years a number of national unions and trade union centres have changed course and abandoned that role. Ali Abunimah,21 May 2009 Seldom has an encounter between an American and Israeli leader been as hyped as this week’s meeting between US President Barack Obama and Israeli Prime Minister Benjamin Netanyahu. As expected, Obama committed himself to diplomacy with Iran and pledged an enormous effort to achieve a two-state solution. Netanyahu continued to incite confrontation with Iran and refused to commit himself to a Palestinian state. On the surface it may seem there are real differences and that the forces arrayed on each side — including the formidable Israel lobby — are gearing up for an epic battle to determine the fate of US-Israeli relations. But Obama offered little new, reaffirming well-worn US positions that view Palestinians, particularly Hamas, as the aggressors, and Israel as the innocent victim. While calling for Israel to halt settlement construction (as US presidents have done for decades), Obama offered no hint that he would back those words with action. Quite the contrary, the president said he would urge Arab leaders to normalize relations with Israel, rewarding it in advance of any renewed peace talks. Let us assume for the sake of argument that Obama applies unprecedented pressure to force Israel to make a deal with the Palestinians. What would such a deal look like? The outlines were suggested in the recent report sent to Obama by a group of US elder statesmen headed by former National Security Advisor Brent Scowcroft. The document, warning that there was only a “six to twelve month window” before all chances for peace evaporated, called on the US to forcefully advocate the creation of a Palestinian state. But this would be a demilitarized truncated state “based on” the 1967 borders. Israel would annex large West Bank settlements and there would be no right of return for Palestinian refugees. This “state” would be occupied indefinitely by a NATO-led “multinational force,” which the Scowcroft group suggests could also include Israeli soldiers (see “A last chance for a two-state Israel-Palestine agreement, 2009). Of course the Scowcroft proposal does not necessarily represent Obama administration thinking, but it expresses the pervasive peace process industry consensus that views such an outcome as “reasonable,” “pragmatic” and all but inevitable, and it accords with Obama’s own statements opposing the right of return and supporting Israel’s demand to to be recognized as a “Jewish state.” In other words, what the vast majority of Palestinians would view as a horrifying plan to legitimize their dispossession, grant Israel a perpetual license to be racist, and turn the apartheid regime set up by the Oslo accords into a permanent prison, is now viewed as bold and far-reaching thinking that threatens to rupture American-Israeli bonds. Netanyahu has little to lose by embarking on another “peace process” after making a show of resisting American pressure (or extracting more American concessions or money). He knows the chances of ever getting to the stated destination are nil. Obama will not apply significant pressure, and even if he did, it is unclear on whom he would apply it, since on the Palestinian side there are no leaders ready, willing and able to carry off a second Oslo-style fraud against their people. Mustafa Barghouthi, 20 May 2009 I cannot recall a more important meeting between an American president and an Israeli prime minister than today’s meeting between President Obama and Prime Minister Benjamin Netanyahu. Will the Obama administration have the courage to challenge Netanyahu, or will all the talk of change dissolve in the face of a concerted one-two punch from Netanyahu and the American Israel Public Affairs Committee? I am increasingly convinced that if Obama fails to speak out now, it will doom the two-state solution forever. Further fiddling in Washington — after eight years of it — will consign Jerusalem, the West Bank and the two-state solution to an Israeli expansionism that will overwhelm the ability of cartographers to concoct a viable Palestinian state. It’s now or almost certainly never. If Obama lacks the political will to stand up to Netanyahu now, he will lack the capacity later. And by the time Obama leaves office, it will be too late to salvage anything more than an archipelago of Palestinian Bantustans. We Palestinians seek freedom, not apartheid, and not the sort of Potemkin villages on the West Bank that Netanyahu is trying to package to the West as visionary economic boomtowns for desperate Palestinians. Yes, we want economic improvement, but the best way to achieve that is through control over our own lives, borders and resources. Israel’s new foreign minister, Avigdor Lieberman, claimed in an April interview that “America accepts all our decisions.” I was in Washington in February and did not find that to be the case. The Obama administration, I was pleased to hear, planned to be in neither the Israelis’ nor the Palestinians’ pocket. That is all we Palestinians have ever asked. Yet, just as in the ’90s, Netanyahu believes that he is the world’s driving force and that a Democratic president should be following his lead. In his memoir, former lead American negotiator Dennis Ross quoted an exasperated President Clinton as complaining that Netanyahu comported himself as though he thought Israel, and not the United States, was the superpower. That doesn’t appear to have changed. How else to explain the recent assertion by Israeli officials that before Israel will address core Palestinian-Israeli negotiating issues, the United States must deal — apparently to Israel’s satisfaction — with Iran’s nuclear program? The false Iran-Palestine linkage troubles me because its Israeli boosters think that Iran is an immediate concern, and Palestinian freedom can once again be kicked down the road. Danny Ayalon, Israel’s deputy foreign minister and a representative of Lieberman’s extremist Yisrael Beiteinu party, said in April that “the Iranian clock should be measured in months,” but the Palestinian timetable “is open-ended.” What Ayalon, Lieberman and Netanyahu fail to grasp is the world’s increasing recognition that they are attempting to dictate the timetable for another people’s freedom. This is unacceptable in the 21st century. “Jerusalem is a final status issue. Israel and the Palestinians have agreed to resolve its status during negotiations. We will support their efforts to reach agreements on all final status issues,” a State Department spokesman said when asked to respond to Netanyahu’s proclamation that Jerusalem would always remain under Israeli sovereignty. At a state ceremony marking the annual Jerusalem Day on Thursday, Netanyahu said” “United Jerusalem is Israel’s capital. Jerusalem was always ours and will always be ours. It will never again be partitioned and divided.” The prime minister said he had made the same declaration during his recent visit to Washington, where he met with United States President Barack Obama over the peace process and Iran’s nuclear program. “Only under Israeli sovereignty will united Jerusalem ensure the freedom of religion and freedom of access for the three religions to the holy places,” Netanyahu added. Palestinian negotiator Saeb Erekat said later Thursday that Netanyahu’s position on Jerusalem was a setback to the goal of a two-state solution, which is strongly supported by the Obama administration. “Mr. Netanyahu, by saying that, he’s saying the state of conflict will be eternal,” Erekat said. 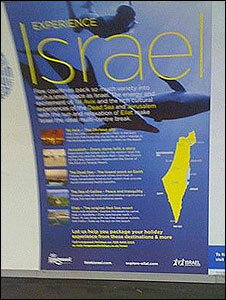 Israel’s tourist ministry has admitted to a “mistake” over adverts on the London Underground after complaints that they “wipe Palestine off the map”. The ads include a map which campaigners say shows the occupied West Bank and Gaza Strip – as well as Syria’s Golan Heights – as integral parts of Israel. The ministry said that in general, maps should not be used on billboards. But it denied a Transport for London statement that it had asked for the offending posters to be removed. Transport for London said it has received about 600 complaints about the poster, while the Advertising Standards Authority said it had had 300. Hugh Lanning of the London-based Palestine Solidarity Campaign said the adverts were a “disingenuous attempt to remove the Palestinians from the public mind, and create a false impression about what constitutes Israel”. The posters were “selling a lie” by suggesting tourists could visit Gaza when the Hamas-run strip is subject to a strict Israeli blockade under which even some doctors and humanitarian workers have been denied entry, PSC said. The map shows Israel, the West Bank, Gaza Strip and the Golan Heights in the same striking yellow colour; the faintest of white lines mark out the Palestinian territories – though not the Syrian one which Israel annexed in 1981. Insufficient vetting Israel occupied the three Arab territories, including East Jerusalem, during the 1967 war. It has since cemented its hold by settling hundreds of thousands of its citizens there. Oren Drori, Head of Marketing Administration for the Israeli Ministry of Tourism, described the adverts as a “professional mistake” with no geopolitical intentions. He said he did not think maps should be used on billboards to advertise tourism in any country and the adverts had not been sufficiently vetted. “We are not tearing anything down,” he said. But the ministry had decided to “fast-forward” to the next set of posters scheduled in the campaign, after learning that there was “a bit of a harsh response” to the map advert, he said. No more map adverts would be posted, he said, and existing ones would be removed as they reached the end of their scheduled display times over the next two weeks, he said. The Syrian Embassy in London, which had lodged its own protest, described the advert as “offensive”. US President Barack Obama is trying to kick-start talks to reach an negotiated agreement creating a state of Palestine in the West Bank and Gaza, although Israeli Prime Minister Benjamin Netanyahu has not signed up to the idea. The fate of the Golan Heights is key to any peace negotiations between Israel and Syria. The pace of home demolitions in Arab East Jerusalem appears to be increasing under the city’s new mayor, an Israeli rights group has warned. More than 1,000 new demolition orders have been issued in Nir Barkat’s first six months in office, the Association for Civil Rights in Israel said. Many Palestinian and Arab residents of the city build illegally because of difficulties getting building permits. The municipality said the Acri report was deceptive and inaccurate. “There have been no changes to the city’s enforcement policy [of demolition orders], nor has the mayor given any orders to increase the rate,” the municipality said.Building in mainly Arab East Jerusalem is a highly politicised issue. The Palestinians want the area to be the capital of a future state, while Jewish groups are trying to increase the number of Jewish settlements there. While Mr Barkat has said he intends to streamline the application process for building permits, Acri said the municipality had added two new requirements to the process, which would make it harder for Israeli Arabs and Palestinians to get permission to build. In a recent decision he also allocated only 7% of funds of a recent, interim budget to East Jerusalem, while the rest went to the Israeli west of the city, Acri said. The Jerusalem municipality said this was misleading, and funds were not allocated geographically. “In terms of Barkat’s actions and budget allocations, there appears so far to be no connection between promises and deeds, and thus there is difference between him and his predecessors; Barkat also neglects and discriminates,” the report said. According to figures released by Acri, 67% of families are under the poverty line in East Jerusalem, compared to 23% in West Jerusalem. It says there is a shortage of 1,500 classrooms in the district, with a 50% drop-out rate and 9,000 children not attending school. But the municipality said Mr Barkat had made improving the quality of life in East Jerusalem a priority. “Attempts to blame Barkat, who has been in office for less than six months, for the failures of the government and the municipality for 40 years are populist,” the municipality said. Earlier this month, the UN asked Israel to freeze all pending demolition orders in East Jerusalem and to do more to provide for the housing needs of Palestinians. Israel has occupied East Jerusalem since 1967. It has annexed the city and declared its east and west Israel’s eternal capital. This is not recognised by the international community, with the east of the city considered occupied territory. “On the rivers of Babylon we sat and cried”… well this was only possible because of the progressive laws of ancient Babylon, which did not make the Hebrew Nakba of the 7th century BC a crime…. Public commemoration of Israel’s independence as a day of mourning could become a crime subject to prison penalty, should a bill approved on Sunday by a ministerial panel be brought to the Knesset and cabinet for vote. The Ministerial Committee on Law and Constitution on Sunday approved a preliminary proposal which would make it illegal to hold events or ceremonies marking Israel’s Independence Day as a “nakba,” or catastrophe. Rather than holding barbecues and parades on Independence Day, Israeli Arabs and Palestinians usually take the day to commemorate the dispersal of Palestinians during the 1948 War of Independence. Palestinian refugees around the world and Israel’s Arab citizens mark the Nakba on May 15, the day after the British mandate over Palestine ended in 1948. Nakba Day is often observed by the Arab population in Israel with marches through destroyed villages. According to the bill, those found in violation could face up to three years in prison. The ministerial approval is only a preliminary step and has no legal bearing yet. Before the proposal could become a law, it must first undergo Knesset approval and cabinet consideration. 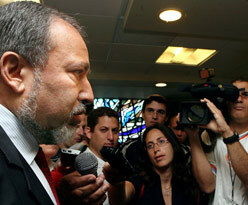 The proposal was brought forth by MK Alex Miller, of Foreign Minister Avigdor Lieberman’s Yisrael Beiteinu party. Below you can see the language used by Ha’aretz, Israel’s only supposed liberal paper, when describing simple facts.Instead of talking about anger in the Israeli governement, it schooses the title: “Israel angry ….” Perhaps some confusion in the mind of the editors? Gideon Levy The acute shift in the United States’ attitude toward Israel interrupted the public in the middle of its springtime nap. This nonstop sleep has continued for at least a decade. Sleep? Heck, this has been a coma. Only one group of people has opened its eyes and gone to work – as usual, the settlers – while the other segments of Israeli society are entrenched in an awful state of apathy and inaction. Tzipi Livni is spending leisure time on a jet ski in Eilat, Meretz is still preoccupied with the pope’s visit, the New Left Movement has been shelved, Peace Now is making do with counting the number of new homes built in settlements, authors are selling new books and celebrating birthdays, most of the media is busy with stupefying absurdities, and silence casts a shadow over the abyss. Israel is arguably standing before the opportunity of a lifetime, yet there is not even a hint of real public debate. The town square is empty – for years it has been devoid of demonstrations and protests, neither for nor against, completely empty. The frightening indifference dragged us into wars, and the no-less horrifying indifference could lead us to miss a rare opportunity for peace.Barack Obama has made Israel an offer it cannot – and must not – refuse, yet Israel fails to wake up. Where are those 57 percent of Israelis who said in the latest Haaretz poll that they support a two-state solution? What do they think? That this solution, which they allegedly support, will fall from the sky, without lifting a finger, without making waves among the depths of society, waves that will put such a grandiose process in motion? Where are the protests against the anti-peace position of our elected prime minister, who continues with his hackneyed we-will-not-divide-Jerusalem and we-will-not-come-down-from-the-Golan? Isn’t it time to stop saying one thing to a pollster and then continue napping? We have demonstrations only when factories are closed, albeit this happens too rarely. Yet there are no demonstrations to protest a country in danger of closing; a country already ostracized among wide swaths of international public opinion; a country up to its neck in its corrupting, brutal settlement enterprise; a country threatened by potential dangers including the shattering of its vital alliance with the United States. Settler leaders are already running to and fro, disseminating their demagogic and ridiculous claims like “natural growth,” along with their standard campaign of fearmongering and threats. The response is nothing. Silence and deep sleep. The field is left completely abandoned to their shenanigans. With the exception of a few determined, yet insignificant, outcast groups on the left, the settlers are the only active element in our society. This is how they will once again succeed in sowing fear and extorting the majority that is allegedly fed up with them (in polls, and only in polls), just as they have done these past 40 years. Tel Aviv will decide the fate of the settlement of Ofra, and Tel Aviv is lying in a coma, not responding, not answering, looking on at the developments with indifference. Obama’s first achievement – restoring the occupation and settlements to their rightful place on the international center stage – has already been noted to his credit. But he has not succeeded in bringing these issues to the center stage of public consciousness, which will ultimately determine its future.